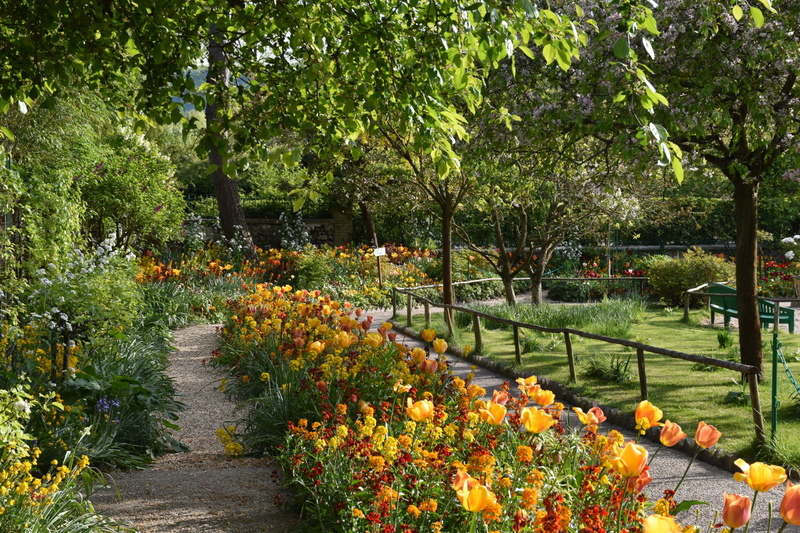 Spring makes us all want to walk in beautiful gardens. 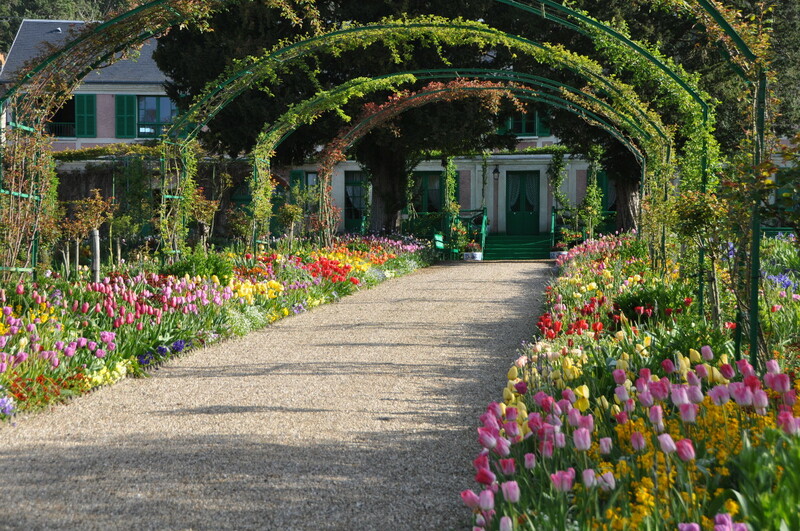 At Giverny, azaleas and tulips gradually give way to irises, peonies and wisterias. 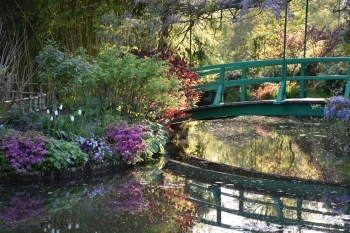 The first water lilies should open within two weeks, recreating once more Monet’s beautiful setting and endless source of inspiration. 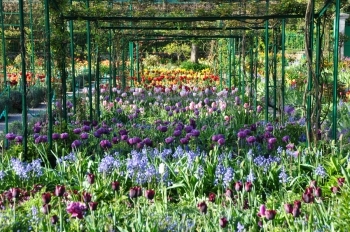 In the flower garden, visitors meander inside of a living painting where flowers recreate the illusion of brushstrokes. 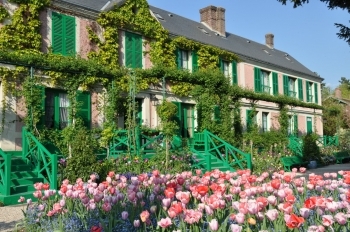 Monet had good reasons to claim that his garden was his most beautiful masterpiece. 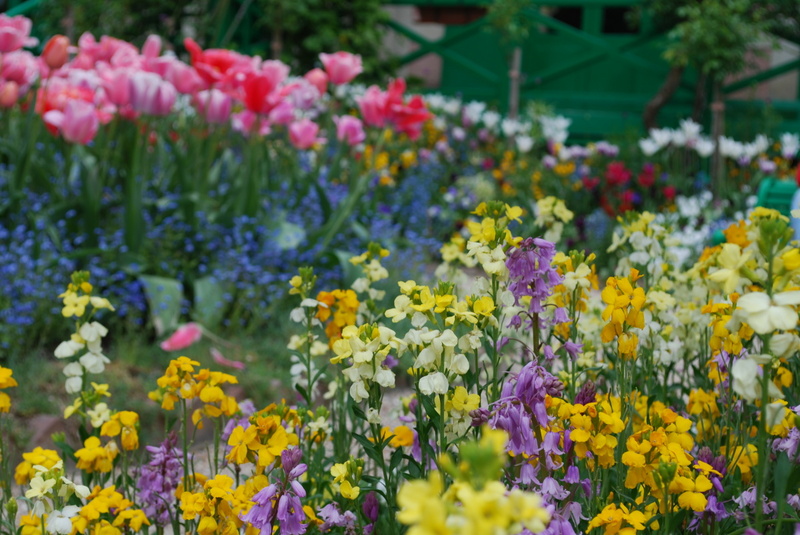 Just like you can see the brushwork when you tour an exhibition and have a close look at paintings, at Giverny each single flower is a little universe in itself, offering its beauties to our admiration. 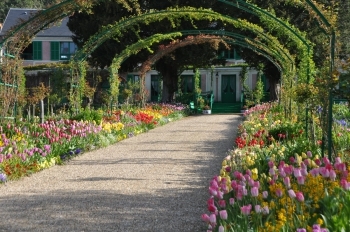 In April, as soon as the sun shines, Monet’s garden radiates. The colors are brighter than ever. Greens are vibrant. Red tulips flame in their complementary color. All the upside down bells of the bulb flowers resemble shiny laterns that have just been switched on. What is the reason therefore? A freshly washed air, cool enough not to contain any haze? Or is it due to the height of the sun? I don’t know. But it is properly amazing and special to early spring. The glow of April makes you want to come out in the garden, to paint and to photograph. While Giverny is closed for the winter, the gardeners of Fondation Monet are busier than ever. 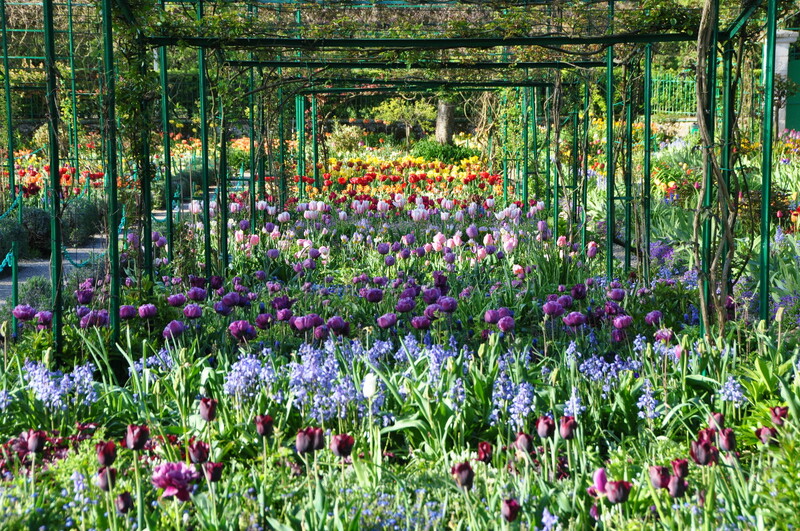 They are getting Monet’s gardens ready for next spring. After pulling out the annuals and cutting the perennials down to ground, they prepare the soil and start the planting. Thousands of bulbs must be planted as soon as possible, preferably before frost. The beds in front of Monet’s home obey the same color schemes every year. 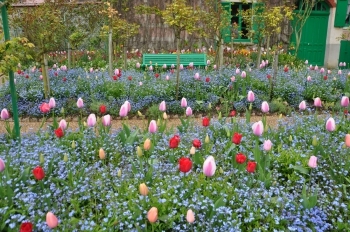 Enormous tulips in different shades of pink combine with blue forget-me-not. The trick is to choose a palette of tones ranging from apricot to mauve to obtain an illusion of brushstrokes. 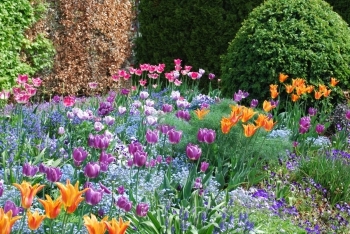 The effect lasts longer than expected because early and late blooming tulips are used together. 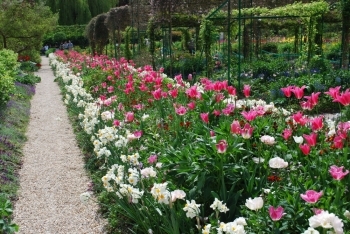 A row of dianthus surrounds the beds. Next to these most impressive pink tulip beds, a border made with different kinds of yellow wallflowers offers a strong contrast in terms of color, size and shape. 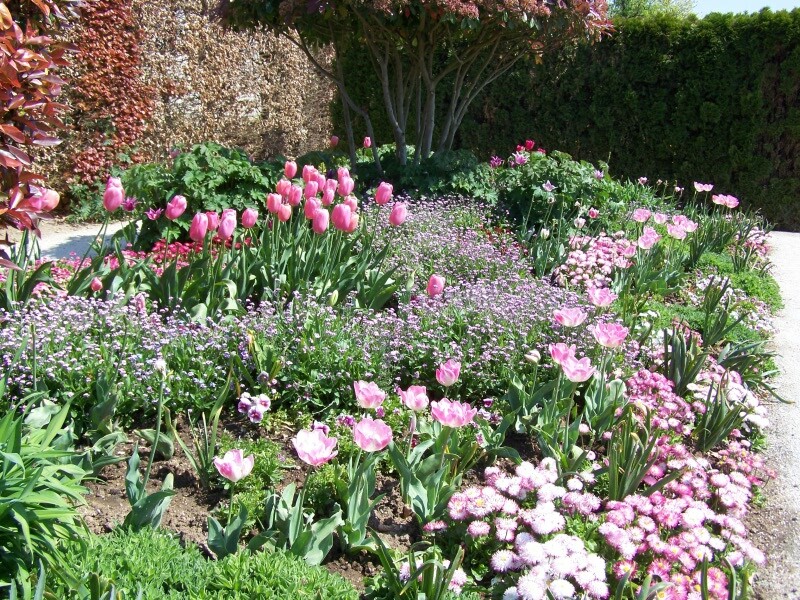 This border located under the pink blossom of three crab apple trees is partly shaded. Mauve blue bells scattered among the wall flowers produce an effect of shade and sunshine. 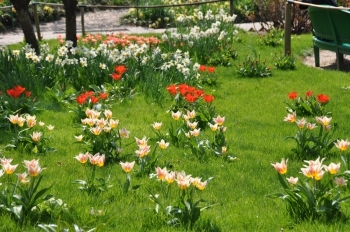 The border is lined by white daisies. Last spring the gardeners added white tulips, for a very fresh result. 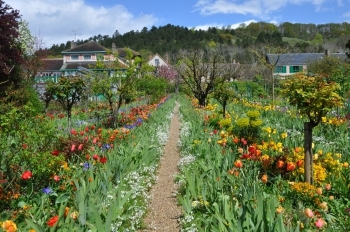 American visitors to Giverny often ask to which agricultural zone Giverny belongs. A puzzling question indeed, as these zones aren’t commonly used in France! Asking about the coldest temperature in Winter doesn’t help a lot, because the Frenchs count in Celsius, not in Farenheit. I finally found the answer: Giverny is in zone 8. During the coldest night of the last Winter, temperatures reached -13°C, that is to say 8°F. This is OK for many plants, trees and bushes, except the most fragile. Some flowers even need frost to understand that it is Winter, and then Spring. 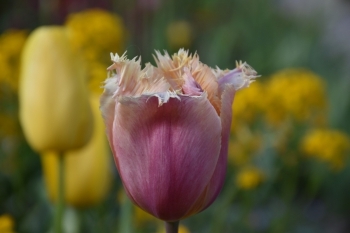 If tulips, for instance, don’t get all the cold they need, they will sulk and refuse to bloom the next Spring! 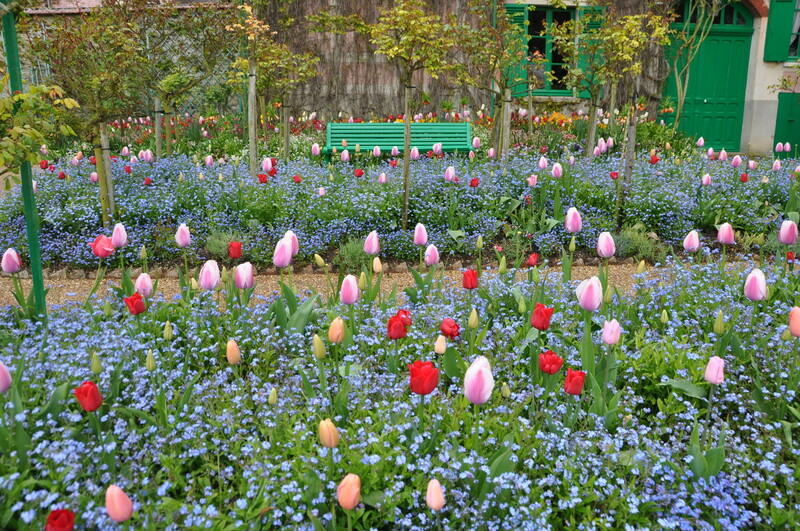 What would be Spring without tulips? They illuminate April in Monet’s garden at Giverny. 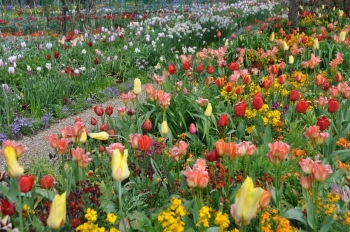 According to the head gardener, the list of the varieties displayed in the garden is very long: several hundreds of types of tulips make the Clos Normand sort of a flower show. 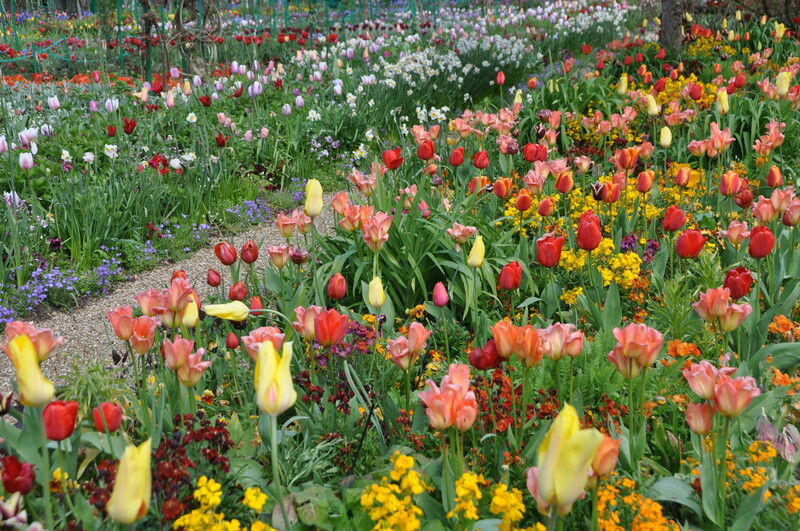 It is unbelievable how different the tulips can be. Their colors range from pure white to almost black red, from light pink to deep purple, from pale yellow to bright orange. They can be ridiculously tiny, or incredibly tall. Some are classically round shaped, other ones look like stars, or are as twisted as a flame. The parrot tulips seem tightly shut jaws. 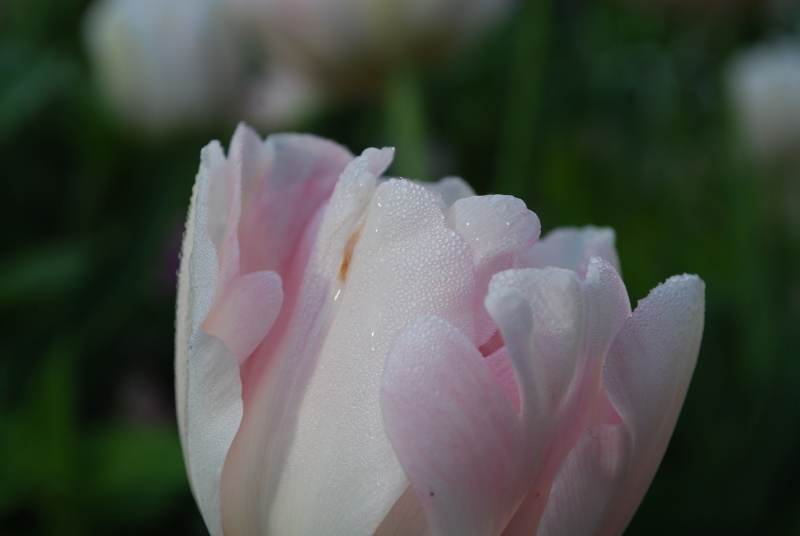 But all of them have this silky quality of petals that reminds of the shine of skin, enhanced by dew in the morning sunshine.